A few days back we ran a poll on Twitter asking about your favorite game, Super Hydorah or Cursed Castilla. As many of you already know, Cursed Castilla won 70% of the votes. Honestly, here at Abylight, we love them both very much (and equally). That’s the main reason why even though Cursed Castilla for Nintendo Switch is heading to Nintendo eShop on January 24th, we did not stop working on Super Hydorah. 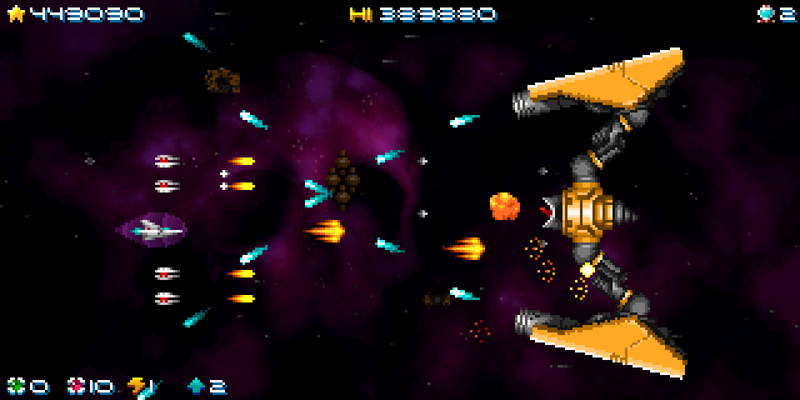 Super Hydorah for Nintendo Switch was released a couple of months back and we have been working, tuning and touching it here and there, since then. As we already mentioned, we are constantly listening to the community to bring you pilots the best experience. Japan is added for distribution on the eShop. Added a "back" button to the New Game selection screen. Added use of the 'X' and 'Y' buttons. Better compatibility with some screen formats in Docked mode. Language selection in the Options Menu. Sound effects and music volume configuration. Tags: arcade, Gryzor87, Locomalito, Nintendo, nintendo switch, SHMUP, shoot'em up.